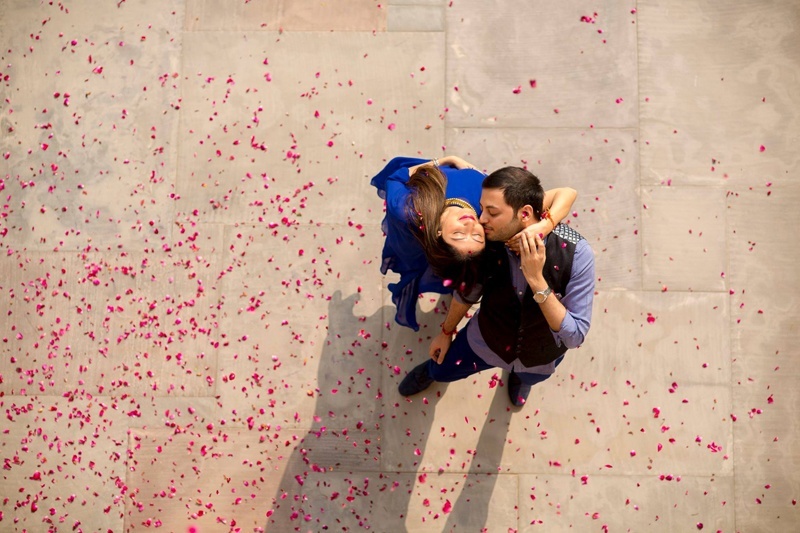 Believe us when we say Bhavna and Raunak’s destination wedding at Fairmont, Jaipur will give you all the destination wedding goals! Right from the onset of the three-day wedding celebrations, the décor, the jewellery and the overflowing happiness left us mesmerized. Each moment was shot brilliantly by the team at Jodi Clickers who captured the sweetest candid moments, secret selfies and the gorgeous portraits of the couple to the T! If you’re planning on making your destination wedding a soulful affair, take notes from this beautiful couple and all the elements of their wedding that made it an inspirational celebration! The first of this three day love-filled wedding celebration began with a bang! The outdoor pool space at Fairmont, Jaipur was beautifully decorated in a vibrant theme of green and yellow with an abundant use of marigolds everywhere – After all, what is an Indian mehndi ceremony without marigolds? They had floral designed cabanas adorned with these fresh beauties in hues of yellow and orange – one like we’ve never seen before! The gorgeous bride, Bhavna sat in front of a bright marigold flower wall while the mehndi artist used her hands as a canvas to create intricate designs of henna. She was dressed to complement the setup of the entire ceremony in her white and yellow-gold lehenga-choli. Her loose curls and contemporary necklace was ideal for this daytime affair, but what had our jaws dropped right to the floor was her awe-inspiring maathapatti! Patterned with beautiful meenakari on gold in a pankh style, it was a piece of bridal jewellery we wish we could get our hands on – absolutely alluring. Raunak followed suit with the style factor in his navy blue and bright yellow embroidered bandhgala jacket paired with white pants – dapper groom goals right here! Bollywood dance sequence or Bhavna and Raunak’s sangeet? It took us awhile to tell the difference. The full family dance performance, the sparklers lined up in front of the stage, the candle lit backdrop – this sangeet was all things luxe! We have a special space in our hearts for that candle wall backdrop – so simply executed and stunning all at once! The couple wore color-coordinated royal hues of navy blue and maroon too. Raunak in a maroon velvet side-buttoned sherwani and Bhavna in a beige and navy blue jacket styled lehenga that had accents of maroon which complemented her beau’s outfit perfectly. P.S – Don’t miss the uber cute parents’ dance performance! One of our favourite kind of pictures are the ones taken moments before the couple tie the knot. The bride adorning herself with gorgeous jewellery, the groom getting his Safa tied, those final touches, the nervous excitement and the blatant love splattered all across their faces – it is one of the most interesting parts of a wedding and the team at Jodi Clickers captured this moments of Bhavna and Raunak brilliantly. This beautiful bride wore a pretty pink and gold Sabyasachi lehenga while Raunak went for classic tones of beige and white. Her layered polki and chaandballi styled maathapatti was a sight to die for! A chandelier strung mandap with floral pillars stood gracefully under an open winter night sky, where this duo took their Saat Pheras. We love how the twinkling tea-lights complemented the grand crystal chandelier and the abundant use of flowers. They created a curtain with white tube-roses that completed the look of this magnificent wedding mandap. The reception was followed by the nuptials with loads of dancing, selfies and wine! (of course) And how could we miss the Filmy cake – we adore little bouts of Bollywood inspiration at Indian weddings – it never fails to add that extra quirk factor and makes a wedding oh-so-insta worthy! To book Fairmont, Jaipur for your destination wedding click right here!